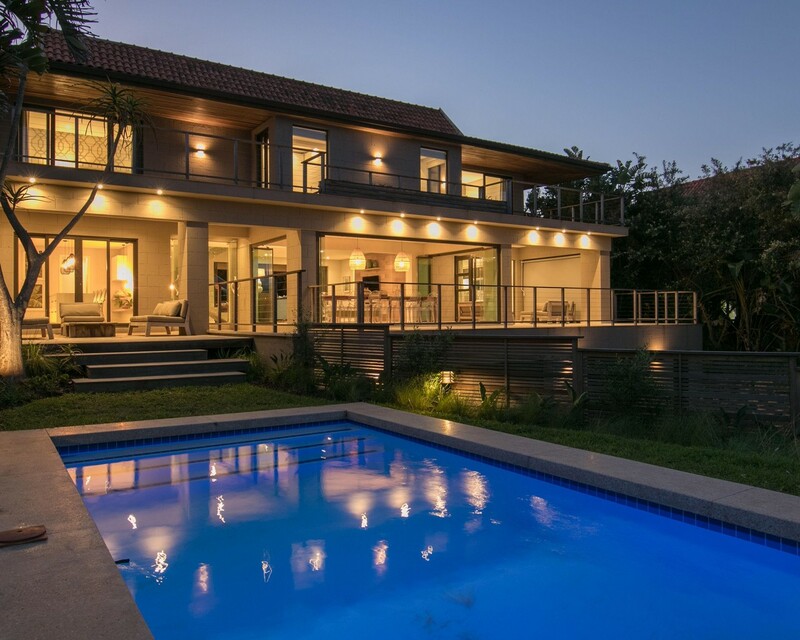 Designer, luxury Zimbali home built to impress. The ground floor comprises an open plan lounge, dining room, kitchen, separate scullery, and two outdoor undercover patio areas on either side of the house. A large relaxing area with braai on the golf-course side, and a smaller lounge area overlooking the private pool on the other. This home has 4 spacious bedrooms all with en-suite bathrooms. The master bedroom and dressing room have beautiful forest views, and are together with the other two bedrooms upstairs. The fourth bedroom, en-suite is on ground level. Some bedrooms have their own private patios . A double lock up garage is available. No Complimentary golf cart included in the rental amount. No Smoking Allowed. Toilet paper, dishwashing soap and black bags provided on arrival. This is a self catering home. Please contact us for our extensive property portfolio options.